Ideal for sensitive skin, these bandages have been specially designed to be gentle on skin. Absorbent non-stick pad is ouchless to remove. 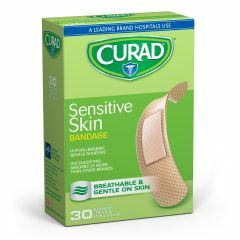 AllegroMedical.com presents The CURAD Sensitive Skin Bandages. Ideal for sensitive skin, these bandages have been specially designed to be gentle on skin. Absorbent non-stick pad is ouchless to remove. Sterile. Latex-free.